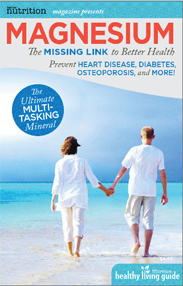 “I have seen particularly great results from simply increasing the amount of magnesium in your diet,” Hallock says. “Up to half of Americans are deficient in magnesium and don’t know it, yet this critical mineral is responsible for over 300 chemical reactions in the body!” She notes that magnesium can be an “antidote to stress, eliminate migraines, alleviate constipation, improve your sleep, and is considered the most powerful relaxation mineral available.” So consider incorporating more magnesium-rich foods into your diet, (like “kelp, avocado, dates, almonds, cashews, figs, tofu, brown rice, collard greens, and shrimp”) or take a magnesium supplement. Hallock says that PMS affects almost 75 percent of women, and occurs because of monthly hormonal imbalances. However, she also notes that there are ways to prevent discomfort, specifically through what we eat. “Sugars, carbs, dairy, caffeine and alcohol all contribute to hormone imbalance. Cleaning up our diet the week before your period is a big contributor to eliminating PMS symptoms.” So if you’re severely affected by symptoms of PMS, try mapping out when you expect to get your next period and try adjusting what you eat for the week before. You just may reap big benefits — totally medicine free. This is another tip that helps with PMS but that can also make you feel good all throughout the month. Hallock specifically recommends eating protein and fats at breakfast. “Think eggs, nut butter, avocado or protein shake,” she says. And in her final PMS-related tip (but let’s be real, that’s when a ton of us are most likely to reach for more heavy-duty pain relievers), Hallock reminds us to simply get moving. “Although exercise sometimes feels like the last thing we want to do when we have PMS, exercise helps with both the emotional and physical symptoms. So lace up those sneaks and get moving! You’ll feel better once you do!” Hallock says.